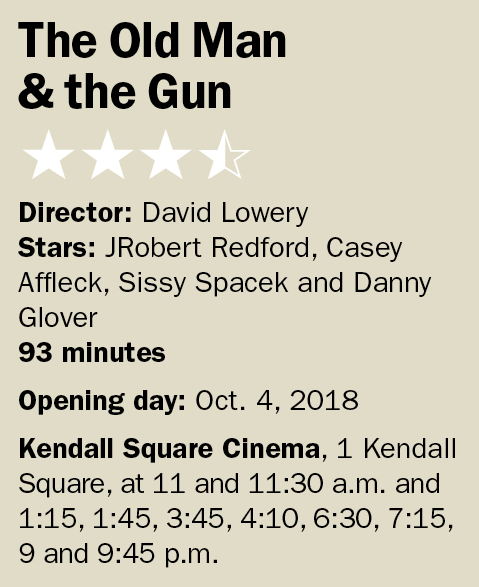 It’s been almost 50 years since Robert Redford rode into cinematic history with Paul Newman as “Butch Cassidy and the Sundance Kid.” In that 1969 film, guns were drawn but seldom used, and never to take out a bank clerk or guard during a heist. Clearly these were thieves raised well and with a civilized degree of humanity … sparking the question: Could the prospect of being robbed at gunpoint be any more enjoyable? The answer, as David Lowery’s “The Old Man & the Gun” has it, is an emphatic yes. In the based-on-a-true-crime film, an 82-year-old Redford (promising his last thespian turn) plays Forrest Tucker, an avuncular gent who robs banks wearing a professorial herringbone tweed jacket and a grandfatherly fedora pulled down tight to shield his mug. He’s quite the charmer when flashing the unloaded pistol of the title, complimenting nerve-wracked tellers on their attire and bestowing friendly insights. You almost expect him to leave a tip. We first catch up with Tucker and his AARP posse (Danny Glover and Tom Waits, both great) as they pull off a caper. All goes smoothly, except at the time there’s a police officer named John Hunt (Casey Affleck) in line with his daughter, and he takes the crime personally. The aptly zealous Hunt, digging around on police blotters, realizes that Tucker and his “Over the Hill Gang” have been operating under the radar for sometime, strategically hitting locales across state lines to keep investigators off their trail. If “Old Man” sounds like a fairly pat cat-and-mouse, catch-me-if-you-can cop thriller, it’s anything but. Lowery, who made the absurd premise of a dead dude lurking about his old abode under a sheet (with holes) riveting in “A Ghost Story,” gets lightning in the bottle again. Part of that is Tucker’s amazing and enigmatic past brought to light in narrative wisps and Paul Thomas Anderson-inspired montages. He broke out of jail 16 times, including from San Quentin, and possesses an incurable itch for the heist. He’s such a cool aficionado of beating the system and gaming the game that as Hunt inches closer, Tucker engages his pursuer, offering him a towel and friendly advice on the case in a public restroom. The heart of the film, however, lies in Tucker’s gold-struck relationship with a recently widowed woman named Jewel (Sissy Spacek). He pulls over in the wake of a take to help her with car trouble, just as the sirens are bearing down. He knows nothing about spark plugs or overheated radiators, but offers her pie at a dinner, where he sits with a conspicuous earpiece dangling from his lobe (to listen to the police scanner) and feeds her sugary white lies while also hinting at the truth about who he is and what he does. She’s largely aware, but doesn’t much care – the notion of Tucker settling down and Jewel having someone to grow old with fills the screen, which make the notion of Tucker getting nabbed all the more foreboding. It’s a charming eddy you know will not last. Like “Butch Cassidy and the Sundance Kid,” you’re all in with those on the wrong side of the law. It’s impossible to justify their misdeeds, but so charmed you’re okay giving your morality a two-hour vacation.